Bhopal:As many as 13 tigers have died in the past one year due to poisoning and electrocution, besides other reasons in two national parks of Madhya Pradesh. 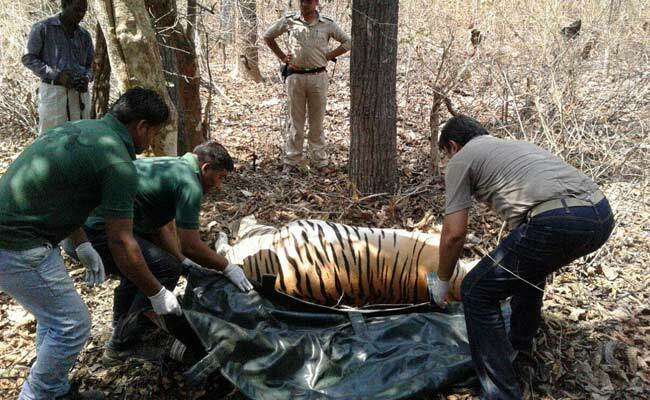 Replying to an RTI query, state forest department said nine tigers have died in Pench national park–known as home to ‘Mowgli’, a fictional character and protagonist in English writer Rudyard Kipling’s ‘The Jungle Book’–whereas four died in Bandhavgarh national park. Wildlife activist Ajay Dubey, who has filed a Public Interest Litigation in Madhya Pradesh High Court seeking a probe in tiger poaching cases in the state’s national parks, sought details of death of the big cats in the last one year. The reasons given by the forest department for tigers’ included poisoning, electrocution, disease, territorial fighting with other tigers and drowning in well. There are six tiger reserves in Madhya Pradesh– Kanha, Bandhavgarh, Panna, Bori-Satpura, Sanjay-Dubri and Pench — which have about 257 big cats. While the tiger population in the country was estimated at 1,706 in 2010, it had risen to 2,226 in 2014. Madhya Pradesh ranks third after Karnataka and Uttarakhand in tiger population.